It’s been a while since I last posted but the Stanley Cup will do that. The subject of my post today stems from a few pictures I took (and tweeted @wildcardweather) a little over a week ago. 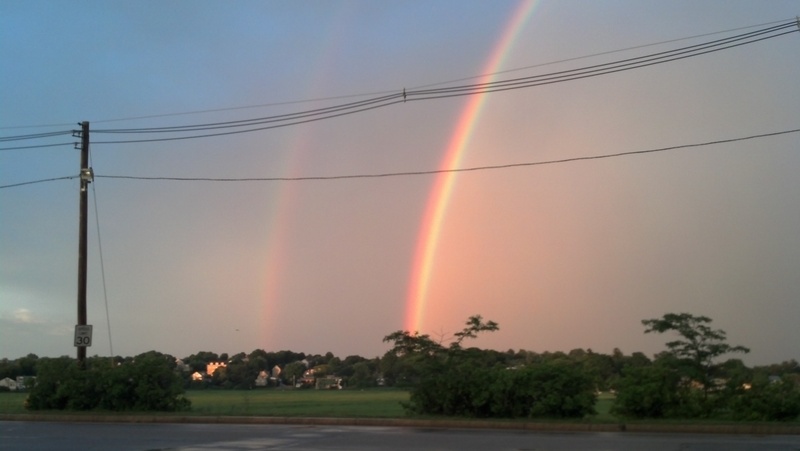 It’s summer and that brings with it plenty more weather phenomena than destructive tornadoes and hurricanes, for what I saw was a beautiful double rainbow. Here is probably the best image I took that day. Rainbows are something that we see in some form or another all the time, but the clarity and beauty of this one made me have to take a picture. So, of course, did many others and a traffic jam soon formed along the beach. Rainbows are formed by light reflecting and refracting inside falling rain drops. 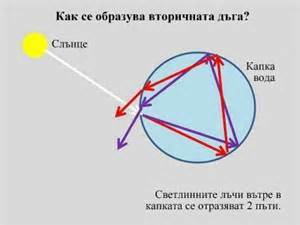 This means you need the sun behind you and rain in front of you to be looking at a rainbow. The schematic looks like this. The path of sunlight to your eye when you are looking at a rainbow. Different wavelengths in the visible spectrum are refracted different amounts, creating the rainbow. But what about double rainbows? If the light reflects twice inside the drop, it approaches your eye at a different angle, colors reversed and appearing higher in the sky. As less light reaches your eye in the fashion, this secondary rainbow will always be fainter. Alright folks, quick, simple, done. See you soon! I wanted to inform everyone that I updated this post today. 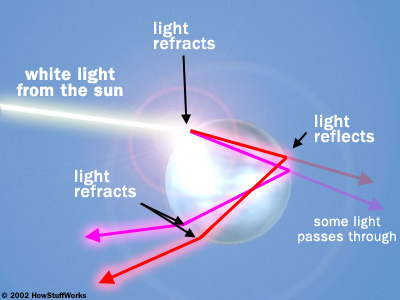 The little paint picture I drew showing the path of light for a secondary rainbow was incorrect. It did not show light being emitted from the drop in such a way as to reverse the colors. I apologize for this, please let me know if you see anything that may be incorrect or you feel I have omitted.